The flowering crabapple tree (Malus species) offers year-round interest in any landscape setting. The tree produces tiny edible fruits known as crabapples. Each April and May, the tree produces an abundance of single or double blossoms that appear in colors of white, pink, red or purple. Depending on the variety of crabapple tree, the fruit ranges in size from 1/4 inch to 2 inches in diameter. Often the fruit persists on the tree into the winter months. The tree's fruit is a favorite food of birds and small mammals. The trees are popular shade trees due to their ease of care. Plant crabapple trees in full sunlight. Planting the tree in partial shade or full shade will limit blossom and fruit production. Choose well-draining soil; the tree does not tolerate wet soil or standing water around its root system. The tree prefers slightly acidic soil conditons with a pH of 5.0 to 7.5. Water the crabapple tree regularly. The tree requires at least 15 to 20 inches of water per year. Crabapple trees are exceptionally drought-tolerant once established, but for ideal growth they do require regular watering. Apply at least 2 to 3 inches of mulch around the base of the crabapple tree. Use peat moss or bark chips. Mulch helps to reduce weed growth, and it will also help the soil retain moisture during the hot, dry summer months. Remove any sucker growth around the base of the crabapple tree. Crabapples are normally grafted onto root stock, so any suckers that spring up from the root are not true to the parent treee. Tear out the suckers as they appear. Prune the crabapple tree in the early spring prior to flower production. Remove any branches that cross each other, and remove dead or damaged wood. Prune back lower branches of the tree to provide a pleasing appearance and allow easier access under the tree. 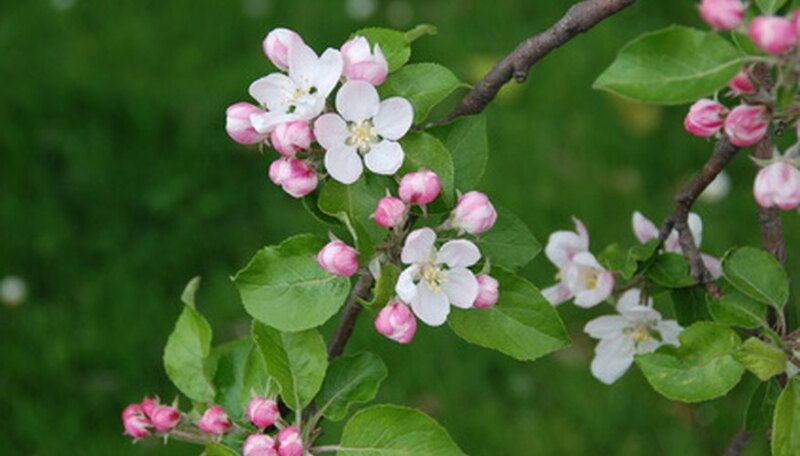 Abstain from fertilizing the crabapple tree the first year after planting. Fertilize the tree in the early spring the second year using a general purpose fertilizer such as 10-10-10. Apply 5 lbs. of fertilizer for every 1000 square feet. Apply around the base of the tree and water thoroughly.